The No. 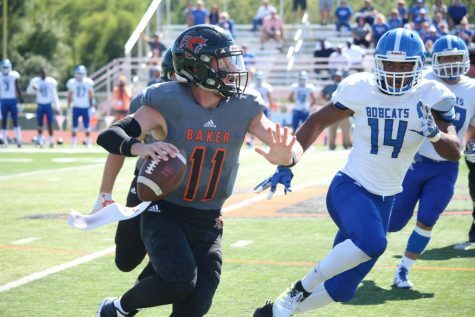 5 Baker Wildcat football team picked up its first road win of the 2016 season with a dominant 41-7 win over William Penn on Saturday in Oskaloosa, Iowa. Senior wide receiver Quanzee Jonson’s four receiving touchdowns helped power the Wildcats to a 3-0 start this fall. Johnson scored Baker’s first four touchdowns of the afternoon and came within two touchdown receptions of the single game school record. Junior quarterback Logan Brettell and Johnson connected five times for 169 yards on the game, helping the Wildcats total more than 600 yards of offense. Johnson tripled his season’s touchdown total and now has six scores in the team’s first three games. In the first quarter Brettell found Johnson for a 96-yard touchdown that started the scoring for the ‘Cats. Five minutes later the duo hooked up for a 33-yard score on a fourth down play to take a 13-0 lead. In the second quarter Johnson scored on a 3-yard touchdown and then capped off his stellar afternoon with a 31-yard score in Baker’s first drive of the second half. Brettell is averaging 376 yards per game through the air in his first three games of his junior campaign. The Wildcat offense is averaging 579 yards per game of total offense. 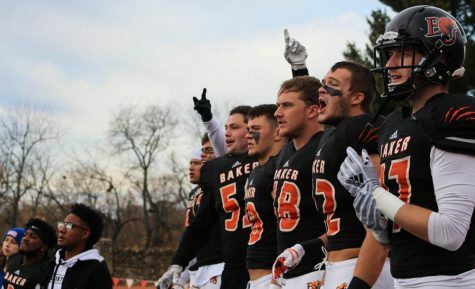 Baker played its most balanced game offensively of the season, passing for 450 yards and rushing for 162. 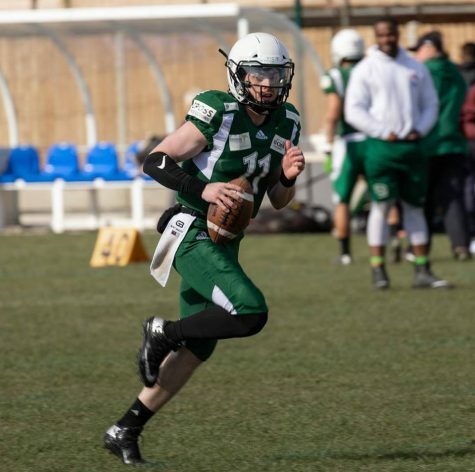 Brettell finished 26 out of 35 passing for 427 yards and five touchdown passes. Brettell now has 14 passing touchdowns for the season. The rushing attack was led by junior Cornell Brown and freshman Nazayah Brown. Brown carried the ball 13 times for 97 yards and one touchdown. Brown added 70 yards on 14 rushes. 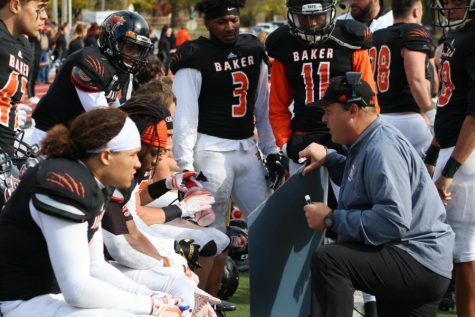 The Baker defense also played one of its most dominant games in recent history, allowing only 200 yards to the William Penn triple option offense. 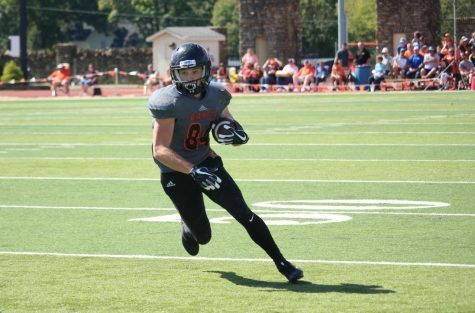 The only touchdown that the Statesmen scored was on a 73-yard kick return touchdown in the first quarter. The Wildcats forced three William Penn turnovers and only allowed two completed passes for 24 yards. The Statesmen were held to 4-for-16 on third down conversions on the afternoon. 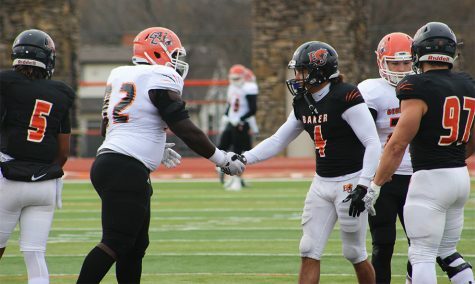 Baker’s defense began the game with four consecutive three-and-outs for William Penn’s offense, totaling only 8 yards. Seniors Avery Parker and Darrain Winston each intercepted their second passes of the season on Saturday. Winston has nine picks in his last 16 games and Parker has five in that stretch. Senior Akim Francis made 11 tackles, senior Kharon Brown was involved in nine, and senior Nick Becker made eight stops. The Wildcats made their first overnight trip of the year a success as they continue to make statements to the rest of the Heart of America Athletic Conference with another blowout win. 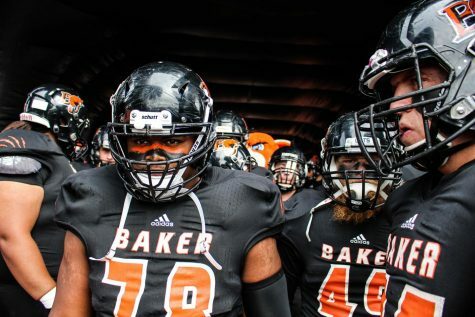 Baker will spend a second consecutive Saturday in Iowa next weekend, this time a 6 p.m. start at Graceland University in Lamoni, Iowa. 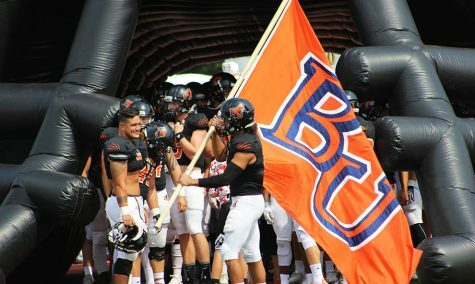 Baker beat Graceland 52-21 last season and the Wildcats have won eight straight games against the Yellowjackets.